It looks like a former member has deleted all the posts in the past newsletter threads. We may want to delete those old threads, as they are useless now. Looking to the future, what does everyone think about a quarterly newsletter? I think monthly might be too frequent - especially in the summer when things die down around here. Quarterly would be perfect, because those have regular jobs do not have time to compose a letter or a section. Plus we need to get the good word out! Living here in South Florida there is no real support from members but , from a 12 supporting members on the" The New Xterra" When I first started we had Friday of Saturday meats around town . Miss those days. I wish I was not so stressed in those days and my heart was not so heavy. But I moved on and I will support best I can. When I return I will be fully engaged! I am in the process in bringing back the newsletters. just trying to find a template of an old one so I have a starting point. I look forward to these coming out. Well we are a month away from our Annual Chili Cook-Off. This is a tradition of AZXC and as we grow this year we expect a lot of entries. There will be a prize for the winner. Check out the information on the forum for time and location. Thank you to everyone who attended the Tucson Camping trip. We had a great time and thanks to TimH for leading the trail and awesome spotting to get us to Chiva Falls and out on Three Feathers! If you attended and have pictures let’s get those posted up, it was an epic time and lots of great scenery for sure. 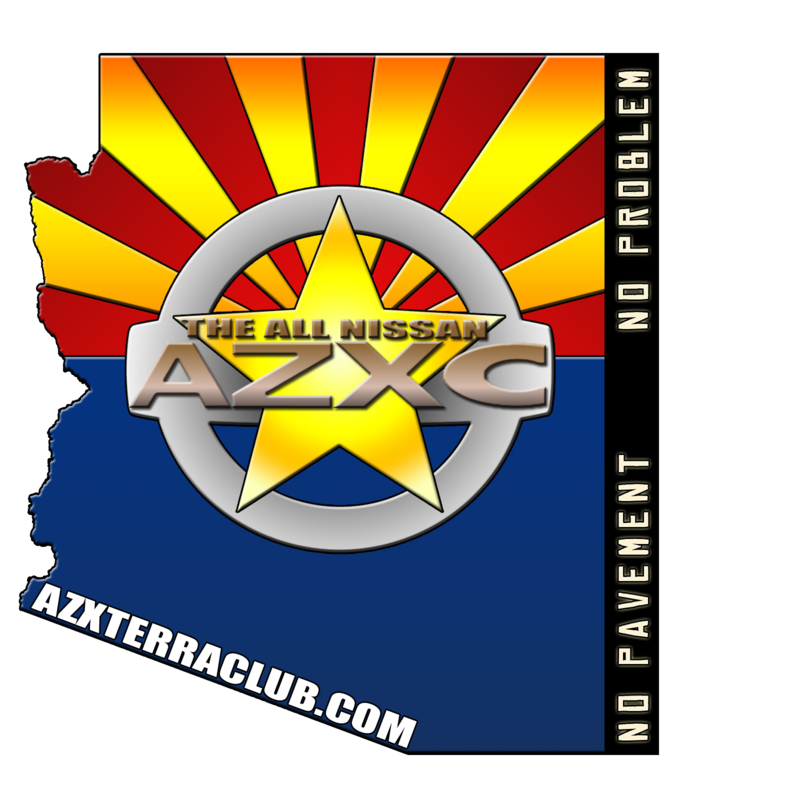 We would also like to welcome VIAIR and ALIEN LED as supporting vendors of AZXC/AZFC & AZTC! The current sponsors not only donated some product for raffles but some also extended out special discounts to the members. We have everything from Nisstec Lifts (www.nissteclifts.com) which offers suspension components for the Xterra, Frontier, and Titan to recovery gear and much more. If you need to secure all our gear don’t forget to check out Raingler Nets (www.raingler.com), who offers the best damn nets and grips in the business! Don’t forget to check out the Contest/Give-A-Way section of the forum. There is an awesome interior cargo rack from XT Fabrication currently in the raffle stage along with a set of Rigid Industries Dually Lights. Also in April we are headed up north to Sedona for a weekend trip. Details are being worked out along with camp locations. This should be an awesome time as well. Those of you who ordered AZXC apparel; it should be back from the printer and out to you within the next week or two at the most.